The verb gustar in Spanish with Examples. Note that in the previous example that liking is conjugated as “like” and not as “taste”. The subject of the sentence is “strawberries”. In Spanish the verb is always conjugated to agree with the subject of the sentence, which means that the verb “to like” must also be conjugated in plural. Dialogue the verb gustar in Spanish explained. -Hello Andrea, how are you? -I am fine, how are you? -I’m good. Do you want to have breakfast? I know a cheap bar very close by. -Perfect, the bar is close, we’ll be there in a minute. -It is very quaint and by the smell it seems very appetizing. -We’ll sit there, next to the window, so we can see the square. – (Waitress) Hi guys, what can I get you? -I will have a coffee with milk and some churros. And you Andrea? -I will also have a coffee with milk and a croissant. – (Waitress) So, two coffees with milk, churros and a croissant. I’ll be right back. -Ignacio, I’ve been here in Madrid for a month and I love it. I like to go to the exhibitions in the Prado and also the entrance is free. -Yes, I also like Madrid a lot. Do you like tapas bars? -I love them. They are old and very welcoming. It is very different from London. – Do you like London? -Yes, very much. And you? -Not really. It is a very expensive city and the people are a bit cold. -It’s true, but it’s very interesting. The two friends finish their breakfast and return to the academy. Ignacio meets with the other teachers and Andrea begins studying. -I do not have my pen or my lesson. Can you give me another copy of the first lesson and a pen, please? – Sure, let’s see. Here are the lessons and a copy of the first lesson. And here we have many pens. You can take one. Andrea takes a pen, a copy of her lesson and starts to study. She likes Spanish and enjoys her classes. She is happy because she always learns something new. The teacher and the classmates are fantastic. It will be a great experience. The verb gustar in Spanish. 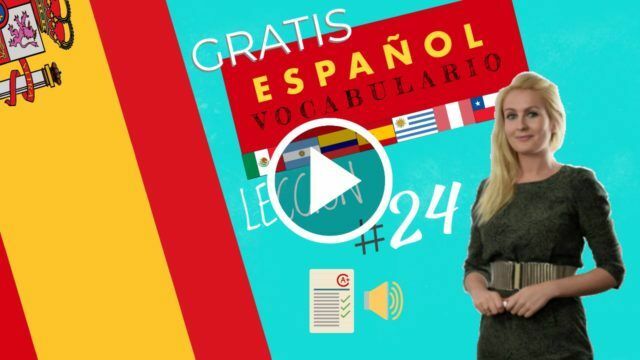 3 / Grammar the verb gustar in Spanish with Examples. Do note that in the previous example liking is conjugated as “like” and not as “taste”. The subject of the sentence is “strawberries”. In Spanish the verb is always conjugated to agree with the subject of the sentence, which means that the verb “to like” must also be conjugated in plural. Therefore, the conjugation of taste changes to “like” when the subject of the sentence is singular. Here are some examples of the correct use of like. Keep in mind that the only ways to like that appear are like and liked, although each of the OI pronouns is used. 1- Where are Andrea and Ignacio? Andrea and Ignacio meet at the language school. 2- What do Andrea and Ignacio decide to do? Andrea and Ignacio decide to go to the bar for breakfast. 3- Why do they go to a bar very close to the academy? Because Andrea is very hungry and the bar very close to the academy is cheap. 4-Where do they sit when they arrive at the bar? They sit next to the window, because that’s how they can see the square. 5- What do you want to take? A coffee with milk and some churros for Ignacio and a coffee with milk a croissant for Andrea. 6-What does Andrea like to visit? She likes to visit the exhibitions in the Prado, besides the entrance is free. She loves tapas bars, they are old and very cozy. 8- Does London like Ignacio? No, for Ignacio, London is a very expensive city and people are a little cold. 9- What do Ignacio and Andrea do when they return to the academy? Ignacio meets with the other teachers and Andrea begins to study. 10- What does Andrea realise? Andrea realises that she does not have her lesson or her pen. 11- The verb gustar in Spanish.